Short protein of 49 amino acid isolated from bovine spleen cells (PUBMED:7306506). Thymopoietins (TMPOs) are a group of ubiquitously expressed nuclear proteins. They are suggested to play an important role in nuclear envelope organisation and cell cycle control (PUBMED:10430029). 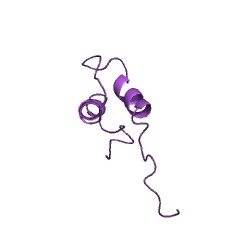 The LEM (LAP2, emerin, MAN1) domain is a globular module of approximately 40 amino acids, which is mostly found in the nucleoplasmic portions of metazoan inner nuclear membrane proteins. The LEM domain has been shown to mediate binding to BAF (barrier-to-autointegration factor) and BAF-DNA complexes. All LAP2 isoforms also share an N-terminal segment composed of a LEM domain that is connected to a highly divergent LEM-like domain by a highly flexible 60- residue linker. The LEM-like globular domain has the same size and structural fold as the LEM domain, but has been shown to bind directly to DNA [(PUBMED:10671519), (PUBMED:11500367), (PUBMED:11435115)]. This entry represents the LEM-like domain. There are 794 Thymopoietin domains in 783 proteins in SMART's nrdb database. Taxonomic distribution of proteins containing Thymopoietin domain. This tree includes only several representative species. The complete taxonomic breakdown of all proteins with Thymopoietin domain is also avaliable. Click on the protein counts, or double click on taxonomic names to display all proteins containing Thymopoietin domain in the selected taxonomic class. On the role of thymopoietins in cell proliferation. Immunochemical evidence fornew members of the human thymopoietin family. Thymopoietins (TMPOs) are a group of ubiquitously expressed nuclear proteins.They are suggested to play an important role in nuclear envelope organization andcell cycle control, as has been shown for lamina-associated polypeptides 2 alpha and beta, which are the rat homologs of human TMPOalpha and TMPObeta,respectively. The recent isolation and characterization of seven mouse TMPO mRNA transcripts named TMPO-alpha, beta, beta', gamma, epsilon delta and zeta, suggestthat more than the three previously reported transcripts, alpha, beta, and gamma forms, may exist in humans. Here we report on the demonstration of putative humanTMPOdelta and epsilon by immunoblotting of human cell lines using a newlyprepared polyclonal antiserum against the common N-terminal region of TMPO.Furthermore, we prepared the first truly TMPO-beta-specific, affinity-purifiedpolyclonal antiserum, using a part of the human analog of the beta-specificdomain of mouse TMPO 220-259 for immunization. We showed that human TMPObeta ishighly expressed in all cancerous cells tested, while hardly anycross-reactivities with other proteins could be detected. In contrast to the highexpression of human TMPObeta in the cancer-derived neuroblastoma cell linesSK-N-MC and SMS-KAN, we found very low expression of human TMPObeta inlow-proliferative nerve tissue. These data led us to the assumption thatexpression of TMPObeta may correlate with the occurrence of cancer, and thereforemay serve as a new tumor marker, or even as a new target for cancer therapy. Complete amino acid sequences of bovine thymopoietins I, II, and III: closelyhomologous polypeptides. Complete amino acid sequences were determined for thymopoietins I and II(revision), isolated from bovine thymus, and for thymopoietin III, a newlyidentified polypeptide isolated from bovine spleen. 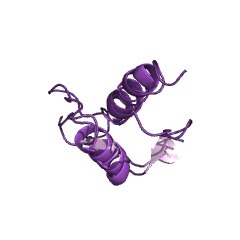 Thymopoietin III (TP-III) is a 49 amino acid monomeric peptide that shows minor microheterogeneity at residue 34. The three thymopoietins have largely identical sequences yet some distinctdifferences, suggesting very recent evolution from a common gene. The completeamino acid sequences are (Formula: see text).